The fish store is a modern yet traditional fishmonger's crossed deli providing the best of local seafoods combined with some different twists of flavours and West Country cheeses. The fish store imports authentic Spanish cooking pans and ingredients, spices and the best rice's available to make the ultimate paellas with all the fishy ingredients freshly available including monk fish, mussels, clams, calamari and even award winning cooking chorizo. You can find excellent value extra virgin olive oil and second pressing pomace oils for multi-use. You can find the very best Cornish sea salt in all shapes and sizes to suit your taste with added flavours in the form of pinch pots including chilli, salt & pepper, onion, smoked, garlic etc. 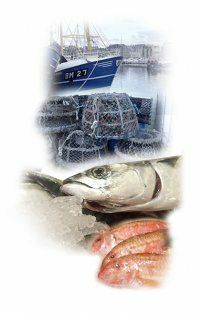 In the fish store you will find the best award winning French fish soups, bisques and cream sauces including beurre blanc, hollandaise, dill, sorrel, tarragon butter and many more for the ultimate luxury accompaniment for your fish. We pride ourselves on Cornish cheeses but happily stock any good quality West Country cheese sold in small retail sizes or in whole truckles from the shop or sent to you for next day delivery. To compliment the artisan cheeses we stock a wide range of flavoured West Country cheddars. You can also purchase fine fish filleting knives that we use on a regular basis (tried and tested) and even oyster shucking knives.